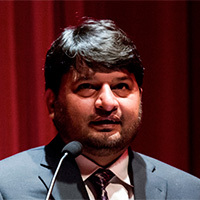 Shahzad Ahmad, the Country Director of Bytes for All, Pakistan. Bytes for All (B4A), Pakistan is a human rights organization and a research think tank with a focus on Information and Communication Technologies (ICTs). It experiments with and organizes debate on the relevance of ICTs for sustainable development and strengthening human rights movements in the country.